PAIGE "Aeldra" top in dot-print. Alice + Olivia "Omega" mixed-print top. Spread collar; V neckline. Long sleeves; button cuffs. Cropped hem. Self-tie closure at hem. 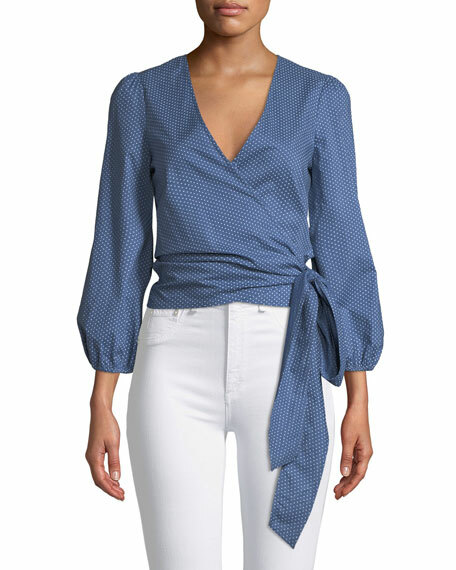 Kobi Halperin "Tami" blouse in medallion print with flounce detail. Lace-up scoop neckline. Long sleeves. Relaxed silhouette. Straight hem. Silk; dry clean. Imported. Model's measurements: Height 5'10"/177cm, bust 33"/84cm, waist 25.6"/65.2cm, hips 35.8"/91cm, dress size US 2-4/FR 34-36. Rails "Ava" striped top with metallic detail. V neckline. Long sleeves; button cuffs. Relaxed silhouette. Yoked back; inverted pleat. Ties at front hem. Slipover style. Rayon. Imported. Model's measurements: Height 5'10"/177cm, bust 33"/84cm, waist 25.6"/65.2cm, hips 35.8"/91cm, dress size US 2-4/FR 34-36.